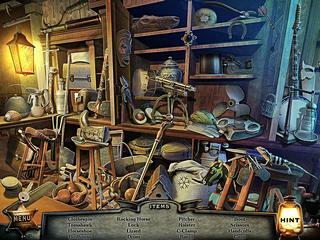 Ghost Encounters - Deadwood is a newly released hiddn object puzzle adventure game. The game features an intriguing story with many interesting and funny characters. Despite some good parts of the game, it still needs some more work to be done with other parts. As to the gameplay, it is not very challenging in general. First of all a few words about the story. It starts out really promising. There is a ghost that takes away the lives of the people of a town of Deadwood. This paranormal adventure with a haunted town, a reived serial killer coming out of his grave, a curse to be broken, tormented spirits looking for rest, and a kid who wants to catch the killer ghost, is interesting enough to keep you playing to see what is next. The graphics of this game are not that incredible, but they are very far from being bad either. 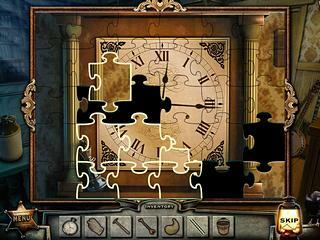 You get many details especially in the hidden object levels. There is voice over in this game and nice music with adventureous spirit. As to the gameplay, it is not very challenging in general. Some of the seek-and-find scenes seem a bit cluttered. Moreover, some of the items do not fall into the category of that specific time period. But that's only for those who care about anacronisms in a game. The adventure becomes a bit frastrating every once in a while because you don't really know what to do or how to get to the next scene. Then again, the puzzle that you come across are all same old mini-games that you have seen before. It might be better to try the free version first before buying to see if you are pleased with everything there is in Ghost Encounters - Deadwood. When I throw my family cpmiang trip the number one thing I make sure that's in my truck is my horse shoes because this is a game that can burn up hours and hours of time. Its a great bonding method for father and sons or new people that are joining your cpmiang party. The next game is and adult game sorry (Beer Pong) all you need is a few ping pong balls 12/18 plastic cup and a picnic or folding table and you have the best adult bonding game in the world. The third best game to me is either three flys up with and football or maybe some good ol frisbee +2Was this answer helpful? This is Ghost Encounters - Deadwood review. Download this game here.